Zero Hero makes special appearances at local events and leads the charge in Zero waste! Zero Hero uses his super powers to instill the importance of recycling and its benefits to our community. Zero Hero is helping Peña’s Disposal educate our community on proper disposal of E-waste to protect our environment! Zero Hero believes we can all make a difference by doing our part and recycle! Zero Hero is available upon request. 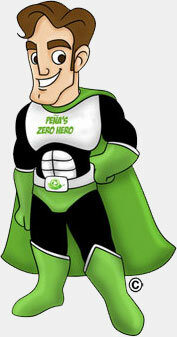 To request an appearance from Zero Hero at your next event, download the form and return it to Peña’s Disposal. A minimum of two weeks notice is required for all events.